Bioinspired Design of Materials Surfaces reviews novel methods and technologies used to design surfaces and materials for smart material and device applications. The author discusses how materials wettability can be impacted by the fabrication of micro- and nanostructures, anisotropic structures, gradient structures, and heterogeneous patterned structures on the surfaces of materials. The design of these structures was inspired by nature, including lotus, cactus, beetle back and butterfly wings, spider silk, and shells. The author reviews the various wettability functions that can result from these designs, such as self-cleaning, directional adhesion, droplet driving, anti-adhesion, non-wetting, liquid repellent properties, liquid separation, liquid splitting, and more. This book presents a key reference on how to fabricate bioinspired structures on materials for desired functions of materials wettability. It also discusses challenges, opportunities and many potential applications, such as oil-water separation devices, water harvesting devices and photonic device applications. Yongmei Zheng, PhD, is a professor at School of Chemistry and Environment, Beihang University. Research interests are focused on bioinspired surfaces with gradient micro- and nanostructures to control dynamic wettability, and develop the surfaces with characteristics of water repellency, anti-icing, anti-frosting, or fog-harvesting, tiny droplet transport, water collection, fog-harvesting and so on. Dr. Zheng has more than 90 SCI publications included in Nature, Adv. Mater., Angew. Chem. Int. Ed., ACS Nano, Adv. Funct. Mater., Small, Chem. Commun., J. Mater. Chem. A, etc., with 12 Cover stories. 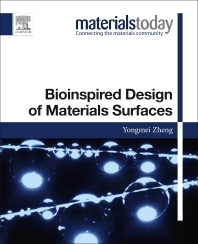 Dr. Zheng has also authored a book titled ‘Bioinspired Wettability Surfaces: Development in micro- and nanostructures’ by Pan Standard Publishing, USA. She is a senior member of the Chinese Composite Materials Society (CSCM), a member of the Chinese Chemistry Society (CCS), the American Chemistry Society (ACS), the International Society of Bionic Engineering (ISBE), and the International Association of Advanced Materials (IAAM). In 2016 she won the ISBE outstanding contribution award for her work in the field of bioengineering and also the IAAM award Medal for her notable and outstanding contribution to the field of "Advanced Materials Science and Technology". Her homepage: http://www.zhengyongmei.polymer.cn.